Poker is a well-known card game where gamers bet for the highest-ranking hand. Depending on which alternative of poker game is being played rules of the game may vary as well as hands of five cards. Hand ranking system is similar throughout all poker variations and the player who has the highest-ranking was considered to be the winner. In some cases the lowest-ranking hand defines triumph. Poker games alter in how cards are managed, whether the highest-ranking or the lowest-ranking hand wins the card session, what variations of bets and their limits are allowed, what configurations of hands are used and etc. 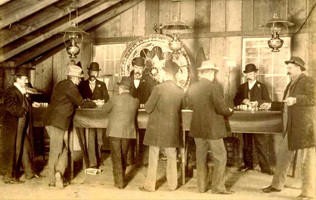 There is great range of different points of view when it comes to the origin of poker game in the gambling history. Still many scientists adhere to an opinion that the modern version of poker was derived from the components of various old games. One popular opinion states that poker history roots back to China when the Emperor Mu-Tsung have played with his wife something that looked like "domino cards" (dated to 969 A.D.) During 12th and 13th centuries hazard games that involved playing cards were noted in Egypt. Among the first recorded games that involved hand ranking, wagering and bluffing were also German Poch (15th century), Persian Ã‚s Nas (16th century), French Poque and Brelan (17th-19th century), Irish Poca, Spanish Primero (16th century)and English Three card brag (16th century). Yet, it is not clear where exactly the game appeared. But it is evident that all these games could influence it and share some elements of the whole game process. According to the land casino history English actor Joseph Crowell made first references to the game that was named "poker". In his book "Thirty Years Passed among Players in England and America" he described a game that was popular in New Orleans in 1829. It involved 20-card deck and 4 players who made bets and argued who`s hand will be more valuable. In 1843 in the book "An Exposure of the Arts and Miseries of Gambling" written by American gambler and inventor Jonathan Harrington Green the spread of poker along the Mississippi river is described alongside with river boats that serveÐ²as "entertaining houses" or in other words casinos. After the first poker tournaments in America it became one of the most beloved games among card players from different countries of the world. In the 1990s poker has spread to the cyberspace network. World Wide Web technologies opened tremendous opportunities for poker fans and still online poker rooms bring a lot of thrills and excitement to gamblers leaving no one indifferent.